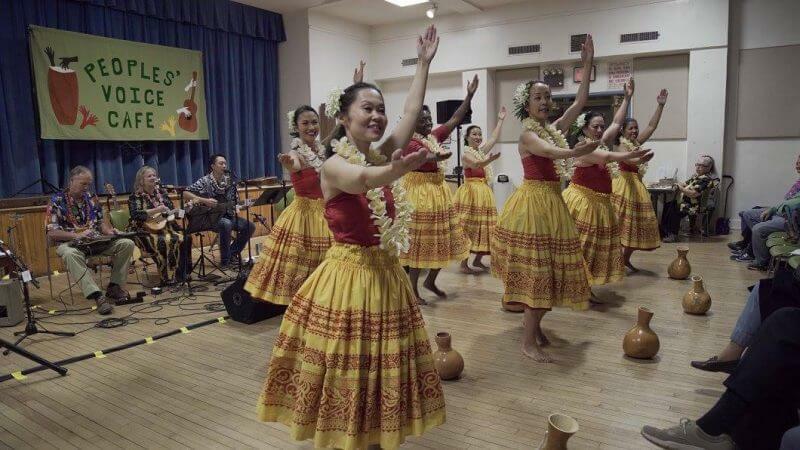 The bill included Jason Poole (The Accidental Hawaiian Crooner, be joined by Tommy Cheng, Kristabelle and dancers Dara Faust & Lisa Herlinger-Thompson from Nā Lehua Melemele,) Triboro (Evy Mayer, Don Friedman, and Phyllis Elkind,) and Pua Ali’i ‘Ilima o Nuioka, under the direction of kumu hula Vicky Holt Takamine of Hawai’i and musicians Claudia Goddard, Chris Davis and Andy Wang. Ping Chun taught everyone a hula. The Peoples’ Voice Cafe hosts a lot of music. Billed as “an alternative coffeehouse offering live entertainment in New York City, from folk music and protest songs to rap and jazz, and poetry, storytelling, and dance,” check the place out if you get a chance. You’re likely to find us there again!